→Vortex Strike Eagle Review – The Four-Model Scope for Everyone! Fan of using both medium and large-sized guns at the same time? 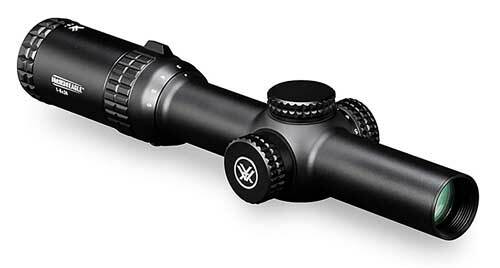 Then you will find the Vortex Strike Eagle a great choice for your hunting or tactical activities. Because when you see how versatile and efficient this scope is – you immediately get drawn into its fantastic performance. What’s better about this model is that it doesn’t only provide the perfect design on a single model, it offers four different models so you can choose the one that fits more with your needs. For example, you can find the 1-6X24 model, the 1-8X24, the 3-18X44 option and the largest one – the 4-24X50 for the bigger rifles. So, whatever your purpose is when shooting – very likely the Vortex Strike Eagle will have what you’re looking for. If you want to know more about it – we invite you to take a look further and learn! Especially in its two smallest versions (1-6X24 and 1-8X24), you will get an outstanding speed and aim versatility that is almost unbeatable for its quality. Handling this scope with an AR-15, for example, is one of the most comfortable and straightforward experiences when shooting, and even more so with smaller rifles or submachine guns. But that’s not all; the scope also provides the perfect zooming capabilities, so you can range from shooting at close range or long range without problems – no matter what gun you use. For those who need a more extensive range of opportunities when shooting, the Vortex Strike Eagle can become a first-option when planning. The fully-coated lenses all the versions of the Strike Eagle model boast are all made with the highest quality in the market. Not only are they capable of providing top-notch images with an outstanding crisp and brightness, but they’re also willing to give a surreal performance in different lights and environments so users can enjoy from a broader range of shooting chances. And not only are these lenses capable of providing a top-notch image, but they’re also incredibly resistant and reliable, even for the long term. The whole construction of the Vortex Strike Eagle, especially in the lenses was thought to deliver that outstanding quality in image primarily but at the same time to become an indispensable accessory for years. With four models available with the Strike Eagle from Vortex, you also get four different reticles to enjoy according to the ability of the scope. 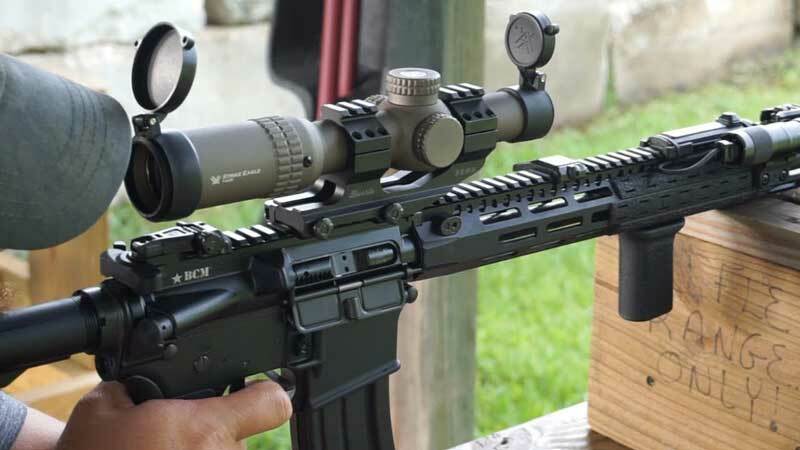 In the shortest scopes at 1-6X24 and 1-8X24, you get the AR-BDC and AR-BDC2 reticles respectively, both with the best rapid-shooting performance for AR-15 fans. These reticles are capable of delivering from 50 to 600 yards of vision and a superb precision at a fast rate of fire. Then you have the most significant scopes at 3-18X44 and 4-24X50, which come with the EBR-4 SFP reticle, with slight changes in resolution. However, the reticle delivers in both a fantastic performance, coming with subtensions and adjustments with MOA measurements – so you can fit your scope depending on your shooting purpose & needs in long-range activities. So, you merely get fantastic opportunities with each model and a wide range of uses with four models that provide specific performances for the most demanding shooters. Although it has intense illumination, reticle focus, power, and windage & elevation adjustments, what sets the Vortex Strike Eagle apart from others at the same quality/price is the magnification ability of the scope model. Even when it has four different models,and each delivers different magnifications from the others – in each one of them this feature is terrific. The two rapid-shooting scopes, for example, come with fast eyepieces designed primarily for quick responses and versatile performances. So, they offer 6x and 8x zooms accordingly, with perfect overall quality and the easiest-to-use constructions. Then come the scopes for the largest rifles and the long-range shooting activities, the 18xand 24x that can provide not only faster-than-average performances but a highly-precise shooting accuracy for their size. And what’s even better – they’re incredibly reliable, thanks to the reticles that go excellently with the magnification. The Vortex Strike Eagle scopes are all made to provide speed, versatility, and reliable performance in each one of the models – from the shortest to the largest one. This immediately harms the quality of construction, as a light and versatile accessory means less efficiency when it comes to being durable – especially for such an incredible price. No scope from the Vortex Strike Eagle models goes over the five-hundred-dollar mark, and that’s also why most users feel the scopes may not provide the most long-lasting quality. Most users report the accessories as cheap & “too light” for their liking – yet nothing that could harm overall performance while aiming or shooting. This quality of construction, however, goes very well with the largeassembly. If it were any sturdier, it would make the scope a little too uncomfortable. Can the Vortex Strike Eagle Fix Every Shooter Expectations? The more designs a model riflescope offers, the more opportunities users get to enjoy according to their needs. The Vortex Strike Eagle is a scope that provides users with a good range of chances to enjoy shooting at close range, long range, quick, slow, and at different magnifications and adjustments. Maybe it is the most versatile model on the market. So, does it fit every shooter’s demands? Very likely it will. There’s almost no doubt, thanks to the four-model design of the Vortex Strike Eagle that allows demanding users to pick the one that fits better with their desired experience. Whether it’s going on a short-range shooting gallery or going hunting in a wide-spaced long-range savannah, you will find a perfect scope in this model for sure.